In this introductory treatment Ali Nayfeh presents different concepts from dynamical systems theory and nonlinear dynamics in a rigorous yet plan way. He systematically introduces models and techniques and states the relevant ranges of validity and applicability. The reader is provided with a clear operational framework for consciously use rather than focused on the underlying mathematical apparatus. The exposition is largely by means of examples, dealt with up to their final outcome. For most of the examples, the results obtained with the method of normal forms are equivalent to those obtained with other perturbation methods, such as the method of multiple scales and the method of averaging. 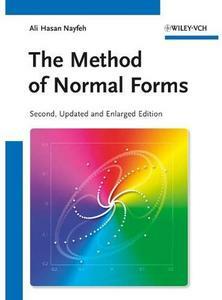 The previous edition had a remarkable success by researchers from all over the world working in the area of nonlinear dynamics and their applications in engineering. Additions to this new edition concern major topics of current interest. In particular, the author added three new chapters dedicated to Maps, Bifurcations of Continuous Systems, and Retarded Systems. In particular the latter has become of major importance in several applications, both in mechanics and in different areas. Accessible to engineers and applied scientist involved with nonlinear dynamics and their applications in a wide variety of fields. It is assumed that readers have a knowledge of basic calculus as well as the elementary properties of ordinary-differential equations.